Delhi, Jan 12, 2019 : Bahujan Samaj Party (BSP) supremo Mayawati and Samajwadi Party (SP) president Akhilesh Yadav will be announcing their tie-up for the upcoming Lok Sabha elections in a press conference in Lucknow today, 12 January. There are two smaller constituents in the alliance: the Rashtriya Lok Dal and the Nishad Party. The likely seat-sharing arrangement could be the SP and BSP contesting 37 seats each, leaving three seats for the RLD and one for the Nishad Party. Uttar Pradesh has 80 Lok Sabha seats in all, Yahoonews reported. The alliance has decided not to put up any candidates against Congress president Rahul Gandhi in Amethi and former party chief Sonia Gandhi in Raebareli, but that’s about all the SP and BSP are willing to concede to the Grand Old Party. Earlier this month, Akhilesh Yadav had alleged that the Narendra Modi government was using the Central Bureau of Investigation (CBI) to try and put pressure on the SP and the BSP. Whether the allegations are true or not, it cannot be denied that the alliance is likely to become a major nightmare for the BJP in Uttar Pradesh, which gave the NDA 73 seats in the 2014 Lok Sabha elections. How Much Would BJP Lose? In the 2014 Lok Sabha elections, BJP and its ally Apna Dal got 43.3 percent of the votes but they won 73 out of 80 or over 90 percent of the seats in the state. This huge different between the vote share and the seat share was because the Opposition vote was divided between the SP, BSP and the Congress-RLD alliance. The combined vote share of the current Mahagathbandhan constituents –SP, BSP and RLD (Nishad Party didn’t exist then) – was almost equal to the NDA at 43.1 percent. In the Assembly elections, NDA got 41.4 percent of the votes but won over 80 percent seats for the same reason: the Opposition vote again got divided between the SP-Congress combine, the BSP, RLD and Nishad Party. This time the combined vote share of the SP, BSP, RLD and Nishad Party was more than that of the BJP at 45.6 percent. How does this translate in terms of seats? If the SP, BSP and RLD had contested as an alliance in the 2014 Lok Sabha elections and transferred their votes effectively, they would have won 43 seats, reducing the NDA to just 35. This means that even in the middle of a Modi wave, the SP, BSP and RLD would have won more seats than the NDA had they contested as an alliance. Now, if we apply the same calculation to the Assembly election, the Mahagathbandhan’s lead increases even further. It would have won 52 seats, reducing the BJP to just 26. However, the C-Voter survey conducted in December 2018 estimates that the BJP might hold its ground in some more seats. It predicts 36 seats for the NDA and 42 for the Mahagathbandhan, very similar to the estimate we arrived at above on the basis of the 2014 Lok Sabha elections. But what if there is a negative swing against the BJP and a positive swing in favour of the Mahagathbandhan? If this happens, Uttar Pradesh could become a major disaster for the BJP. A three percent swing against the NDA and a corresponding swing in favour of the Mahagathbandhan, would give the alliance 62 reducing NDA to just 17 seats. A 5 percent swing for the alliance and against the NDA would mean a wipeout. The result would almost a reverse of the 2014 Lok Sabha elections: 70 seats to the Mahagathbandhan and eight to the NDA. The success of the alliance would depend entirely on their ability to transfer votes to the other parties. This has largely to do with the different social bases of the various constituents. 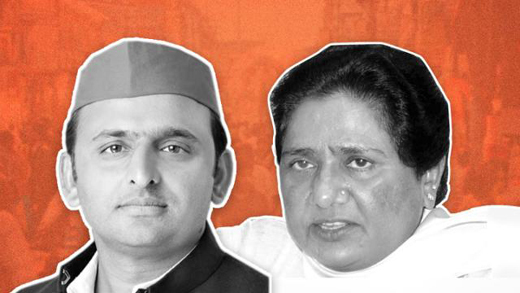 SP, BSP and RLD have all relied on Muslim voters in the past and it is likely that the community will consolidate behind the alliance in a substantial way. However, the difficulty would be in ensuring that BSP’s Jatav voters, SP’s Yadav voters and RLD’s Jat voters vote for the Mahagathbandhan in seats where the party of their choice isn’t contesting. The alliance would also have to reach out to other communities, particularly non-Yadav OBCs and non-Jatav Dalits. We got a glimpse of this in the three by-elections that were held since the three parties began cooperating in 2018. In the Phulpur by-election for instance, there was a near perfect vote transfer from the BSP to the SP candidate. The combined vote share of the Mahagathbandhan parties was 46.5 percent in the 2017 Assembly polls and the SP candidate polled 47 percent in the bypoll. What is also significant is the steady decline of the BJP in the seat, from 52.4 percent in 2014 to 43 percent in 2017 and 38.8 percent in 2018. The Mahagathbandhan’s margin would have been higher had it not been for the presence of independent candidate Ateeq Ahmed. In Gorakhpur, the seat vacated by Uttar Pradesh chief minister Yogi Adityanath, the situation was a little different. While there was a near perfect transfer of votes from the SP and BSP to the Nishad Party candidate contesting on an SP ticket, the BJP’s vote share actually increased by 6.4 percent between 2017 and 2018. But there was a positive swing of 6.5 percent in favour of the alliance as well. The only party which suffered a loss of votes was the Congress, whose vote share fell from 10.7 percent to just 2 percent. The bypoll in Kairana later that year was a bigger challenge, given that the seat had witnessed a high degree of communal polarisation after the 2013 Muzaffarnagar violence. And the Mahagathbandhan put up a Muslim candidate Tabassum Hasan, who is from the SP but contested on an RLD ticket. The challenge was to make Jat voters, who had consolidated behind BJP after the Muzaffarnagar riots, vote for a Muslim candidate. The alliance campaigned strategically with Tabassum Hassan and her son and SP MLA Nahid Hassan concentrating on Muslim-dominated areas and RLD chief Jayant Chaudhary focussing on the Jat-dominated ones. While Tabassum Hassan won, securing 51.3 percent of the votes against BJP candidate Mriganka Singh’s 46.5 percent, the margin should have been higher as the Congress which secured 17 percent votes in the Assembly elections wasn’t contesting. The swing in the three bypolls compared to the Lok Sabha elections reveal two different patterns: one in which the BJP lost ground and the Mahagathbandhan won by merely transferring votes like we saw in Phulpur and another in which both the BJP and the Mahagathbandhan gained in vote share, partly at the expense of the Congress. The bypolls revealed that there are some seats where the Mahagathbandhan would find it easier to win than others. Let’s go seat wise and see where the alliance is likely to have the maximum impact and where the BJP might maintain its lead. For this, we can divide the 80 seats in Uttar Pradesh into three categories, based on the vote share of the NDA, Mahagathbandhan and Congress in the Assembly elections. The vote share has been calculated by adding up the votes secured by the parties in the assembly segments within each Lok Sabha constituency. The table reveals a clear urban-rural as well as regional variation. The BJP has a comfortable lead urban centres like Ghaziabad, Bareilly, Varanasi, Gautam Buddh Nagar and Kanpur but it is doing poorly in eastern Uttar Pradesh. On the other hand, the Mahagathbandhan is doing extremely well in Eastern Uttar Pradesh and in Muslim-dominated seats in Rohilkhand. The SP’s vote share has been underestimated as it contested less than 300 seats in the Assembly polls, leaving the rest for the Congress. Also, the Congress tends to do better in Lok Sabha polls than Assembly polls so it could eat into the Mahagathbandhan’s and BJP’s votes in a number of seats.And finally, we still can’t say what the impact of the NDA’s move to provide reservation to economically weaker sections among the general category will be.